Cost Plus World Market, a specialty retailer known for selling home furniture, decor, gifts, coffee, wine and various international food products, is on the move in Buckhead. Plans call for the retailer to relocate its Buckhead store from Piedmont Peachtree Crossing on Piedmont Road to Buckhead Station, on Lenox Road. Judging from available information, the new location will be slightly smaller than the current store, but in line with other area locations. The existing World Market store is 20,025 square feet, while the new store will be 18,300 square feet. The Piedmont Peachtree Crossing site plan also reflects Cost Plus as having a separate space "O2C" of 2,003 square feet, marked as "storage," below the store itself. For comparison's sake, the Cost Plus in Perimeter Village in Dunwoody is 18,260 sq. feet , Cobb Place in Kennesaw 18,277 sq. feet, Heritage Pavilion in Smyrna 18,750 sq. feet, and in the Marketplace at Millcreek in Buford 18,225 square feet. The Buckhead move brings the store to the same center as its corporate owner, Bed Bath & Beyond, who acquired the retailer in 2012. Both Piedmont Peachtree Crossing and Buckhead Station are owned by New York-based real estate firm Equity One. Real estate sources credit the move to Equity One's planned redevelopment of Piedmont Peachtree Crossing where Cost Plus was likely not going to be involved. The only existing tenant likely to be included in the redevelopment is current anchor Kroger which has been shown on renderings of the redevelopment. Current plans call for Cost Plus World Market to move some time in late August or early September of this year. Although not shown or listed in a site plan for Buckhead Station, the retailer is listed as as one of the center's "powerful line up of tenants" on its website. 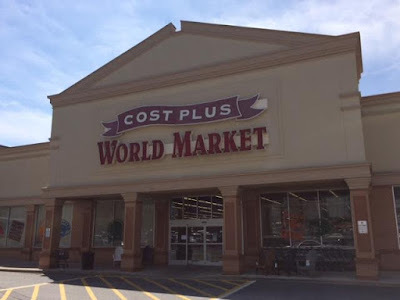 Are you a fan of Cost Plus World Market? Do you think this move makes sense? Are you in favor of the proposed redevelopment of Piedmont Peachtree Crossing? Great news. This move will bring it much closer to Buckhead Station. Not that it's soooo far now but the walk from the station to there now requires crossing the five lanes of Piedmont Ave. and navigating a few acres of parking lot, a parking lot which some people are driving across while texting, changing the radio station and smoking a cigarette all at the same time.